If modern and sophisticated aren’t really your thing, you’ll love these speakers. Instead of buying something that looks like every other speaker out there, you could have one that is bound to make a memorable statement. Plus, despite having that homemade look to it, you won’t actually have to make this a weekend project. You can purchase one already made for you. The Audio Can is not meant to be taken too seriously though, it’s meant to be a playful version of your usual portable loud speakers. 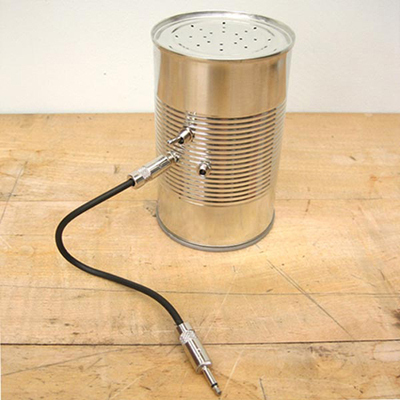 This speaker finds itself crammed inside of a food can. It has a 9V battery and an audio cable with the normal 3.5mm connector. You can hook this up on its own or you can connect more than one of these to create a surround sound type feel. These come with a yellow label, green and grey. You can purchase one of these for £ 27.50 or about $45.